Potential benefits offered by preclearance operations are significant in all transportation modes. Benefits are greater for air travel and at the busiest border points. Many benefits of preclearance can be measured quantitatively. Preclearance refers to a process in which customs, immigration and other border functions of a foreign country such as the United States (U.S.) are undertaken within a host country of Canada. Such operations can potentially generate significant benefits for governments, users and carriers. Preclearance benefits have not generally been the subject of much measurement. Currently, air passengers can be precleared for U.S. travel at eight Canadian airports. For marine passengers, preclearance facilities are in place in Vancouver (cruise terminal) and Prince Rupert, while U.S. immigration pre-inspections are provided in Victoria and Sydney. For rail passengers, pre-inspections facilities are in place only at Pacific Central Station in Vancouver. Air preclearance has been formalized, while all other initiatives do not have a legal framework. Finally, a pilot project for freight pre-inspection is in operation, with Phase II currently taking place at the Peace Bridge at Fort Erie. This report summarizes the international literature on the economic and social impact of preclearance operations. It identifies additional benefits of preclearance not well covered in the literature, and it proposes feasible methodologies to quantitatively measure the benefits to Canada of establishing preclearance processes and facilities in various contexts. In general, the policy objectives of preclearance are centered on issues of security, service and cost optimization, and international cooperation. Internationally, the U.S. operates preclearance facilities in a number of countries, including Ireland and the United Arab Emirates. Mexican authorities operate an air cargo preclearance facility in Texas. Otherwise, the only other preclearance operations known to the research team – the juxtaposed controls between the UK, France and Belgium – are centered on reducing the number of asylum seekers and illegal immigrants. In this report, benefits are defined to include the whole spectrum of positive consequences flowing from preclearance operations. Using this wide definition allows for a more complete understanding of the implications of preclearance and can inform policy discussions. Casting a wide net does not mean, however, that these benefits must be reported with care as they are not necessarily cumulative. The report provides guidance on this issue. 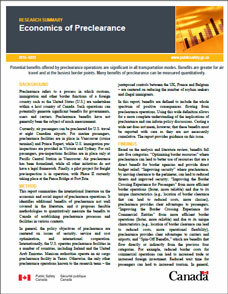 Based on the analysis and literature review, benefits fall into five categories; “Optimizing border resources” where preclearance can lead to better use of resources that are a direct benefit for border agencies and provide direct budget relief; “Improving security” where preclearance, by moving clearance to the perimeter, can lead to reduced threats and improved security; “Improving the Border Crossing Experience for Passengers” from more efficient border operations (faster, more reliable) and due to its unique characteristics (e.g., location of border clearance that can lead to reduced costs, more choices), preclearance provides clear advantages to passengers; “Improving the Border Crossing Experience for Commercial Entities” from more efficient border operations (faster, more reliable) and due to its unique characteristics (e.g., location of border clearance can lead to reduced costs, more operational flexibility), preclearance provides clear advantages to carriers and airports; and “Spin-Off Benefits,” which are benefits that flow directly or indirectly from the previous four categories. For example, reduced border costs for commercial operations can lead to increased trade or increased foreign investment. Reduced wait time for passengers can lead to increased tourism. In general, benefits in the first four categories spans a wide range of beneficial impacts of preclearance which generally can only be assessed using input-output or computable general equilibrium models. Proposing specific methods to measure the benefits of preclearance requires establishing clarity and trading-off between a number of factors, including: robustness and availability of data, the scope of the analysis, and the focus of the analysis. The report provides guidance and information on how each of these issues would impact the methodology proposed. One thing of particular importance is that it is almost impossible to accurately assess division between whether benefits accrue mostly to the host or the foreign country. As such, the research team strongly recommends that any framework adopted does not limit the scope of benefits (i.e., that it include benefits flowing outside of Canada), leaving discussions of the distribution of benefits as a qualitative component of the assessment. Potential benefits offered by preclearance operations are significant. Indeed, a very preliminary assessment of the preclearance facility in Toronto’s Pearson Airport finds, based on a heavy set of assumptions which would be verified in any serious measurement endeavour that measurable preclearance benefits for these operations could be of the order of $47.3 million per year, or nearly $570 million dollars over a thirty year period (discounted at 8% per year). Most of the significant government-related savings (infrastructure, operational, administrative savings), which accrue solely to the U.S., are not included in this total. All benefits measured are shared between Canadian and American carriers and passengers, as well as with some international passengers. Of course, benefits can differ widely, both in their nature and their magnitude, based on the mode and the port of entry. In most cases, benefits to passengers and carriers are driven by the potential for faster customs clearance and the associated time saved. In the air sector, however, the additional operational flexibility leads to much larger benefits, both to passengers (increased choices) and airlines (terminal fees). The extent to which airlines are able to collect these benefits through higher fares (i.e., how the benefit is divided between passengers and airlines) is hard to establish. In the trucking sector, the benefits associated with lower inventory carrying costs accruing to shippers are potentially significant. This benefit is contingent on saving time at the border. In some cases, the benefits from lower infrastructure or operational costs could be particularly interesting for border agencies. Similarly, while too hard to accurately value, security benefits are potentially very significant. Finally, it can be noted that other benefits, largely driven by the primary benefits noted above, can be measured using economic modeling. These models rely on a heavy set of assumptions and can be perceived as not being particularly transparent. On the upside, they do capture a number of impacts which are otherwise practically impossible to capture directly, including potential for improved productivity, improved competitiveness and increased tourism. Unfortunately, because of the methodologies used to measure these benefits, they cannot be meaningfully compared with or added to other measurable benefits, nor can they be compared to the costs of the project/facility. They could, however, be reported separately to inform the discussion about the value of preclearance initiatives to specific stakeholders and the wider economic competitiveness of the country. Arsenault, J.-F., J.Taylor, Roy, M.-A. and Pelletier, J.-F. (2014): 78 p, Economics of Preclearance: Literature Review, Discussion, and Proposed Measurement Methodologies. Research Summaries are produced for the Community Safety and Countering Crime Branch, Public Safety Canada. The summary herein reflects interpretations of the report authors’ findings and do not necessarily reflect those of the Department of Public Safety Canada.